Smart Luggage Market size was over USD 630 million in 2016 and is predicted to grow at over 16% CAGR from 2017 to 2024. Consumer shift towards lifestyle, leisure, and style-quotient is expected to drive the smart luggage market for the next seven years. Growth in internet penetration and increase in international air travel is expected to drive the technological innovation. Growing penetration of Internet of Things (IoT) has compelled the players in the baggage segment to equip the luggage with smart features such as traceability and advanced locking system. This is expected to attract tech-savvy customers to a large scale over the forecast timeframe. The technological advancements such as location & proximity alerts, automated locking, tracking system, and connectivity with smartphones have transformed the regular baggage to an intelligent subsystem that can be linked to the smartphones. For instance, the range of baggage from Bluesmart consist of a digital handle that is a digital scale to measure the weight of the bag. Furthermore, the case is protected with a digital lock which gets activated when it is moved away from the phone. Integration of these products with analytics is expected to provide viable growth opportunities. The airlines can use the data for marketing and for enhanced security & customer experience. Advancements such as machine-to- machine communication to keep the baggage safe and collected is expected to gain momentum, thus driving the smart luggage market growth. Advancements in technology have enabled the customers to enjoy their journey with high degree of comfort. Connectivity technology is expected to hold major share of the smart luggage during forecast time. Based on connectivity technology, RFID is expected to witness high growth, owing to existing infrastructure of RFID scanning on the airports. 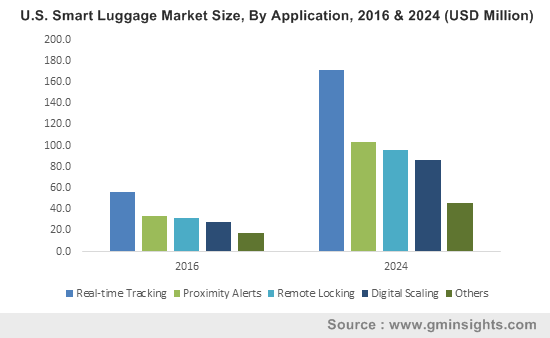 Proliferation of sensor-based smart baggage products is expected to be a growing trend, owing to increasing penetration of IoT devices and relatively low costs & maintenance requirements of the sensors. The smart luggage is connected to the user using a companion application. These applications provide user with intuitive travel experience and providing information including flight schedules, currency exchange, destination, gates, and weather. 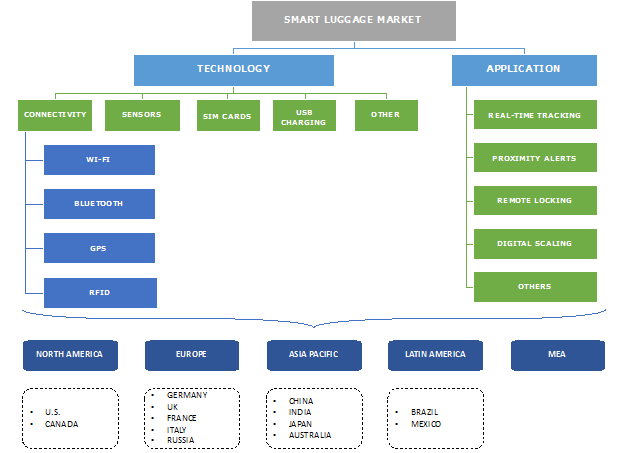 Use of SIM cards to access the internet is expected to provide growth opportunities to the smart luggage market. Real-time tracking applications are expected to gain popularity over the forecast timeline, owing to increasing instances of loss of luggage by the airlines. Thefts of luggage and security breaches have encouraged the customers to buy smart luggage equipped with remote locking and proximity alerting capabilities. Digital scaling in the smart baggage systems is expected to gain consumer focus, as it avoids the last-minute hassle of the passenger travelling with an over-weight baggage. The weight sensors in the bag calibrates itself when the bag is empty. When the packed bag is picked up, it indicates the total weight of the bag. Ease of use and benefits such as companion app is expected to drive the smart luggage market demand. However, high costs and lack of awareness about the products are expected to hinder the smart luggage market growth during the forecast timeline. North America is expected to hold majority share in the smart luggage market, owing to high adoption of technologically advanced products and presence of manufacturers that focus on innovative product design. Asia Pacific is expected to witness the highest growth, owing to increased air traffic, particularly in densely populated countries such as India & China and countries with large number of tourist footfall such as Thailand, Singapore, & Malaysia. Feasibility limited to only airports due to connectivity issues is expected to be one of the major areas of concern. These products confuse the TSA scanners, owing to the mesh of wires & battery chargers and RFID tags. Concerns pertaining to security and privacy of the personal data such as personal & confidential details and travel itinerary are expected to decelerate the smart luggage market growth. The industry is highly competitive and is characterized by the presence of a few major players and several small players & new entrants. Key players in the market include Delsey, Bluesmart, Samsonite, Away, Reden, Trunkster, Barracuda, and Lugloc. Major luggage companies are investing in incorporating the technology in their products and offer enhanced & tech-savvy features to the customers. The players in the smart luggage market focus on product development to gain competitive advantage. For instance, Bluesmart introduced Series 2, new smart travel products system. The system consists of checked bag, carry-on bag, laptop bag, and a passport pouch, which can be connected to each other and the user using an application. The luggage market is growing consistently, owing to increase in travel and focus on smart & trendy luggage that ricochets owners’ personality. It is increasingly equipped with the tracking systems such as RFID tags to prevent loss by the airlines and increase operational efficiency of the airlines by point-to-point tracking mechanism. Increasing instances of mishandled luggage have prompted the baggage manufactures to improve its capability such that it can be tracked easily by the owner. Furthermore, implementation of smart bag tags to reduce the instances of mishandled luggage by the airports aide the proliferation of smart luggage, as they fit in the existing RFID infrastructure at the airports.